Hugh Clowers Thompson Jr. (April 15, 1943 – January 6, 2006) was a United States Army Major, and a former warrant officer in the 123rd Aviation Battalion of the 23rd Infantry Division. He helped end the My Lai Massacre of the South Vietnamese village known as Sơn Mỹ on March 16, 1968. During the massacre, Thompson and his Hiller OH-23 Raven crew, Glenn Andreotta and Lawrence Colburn, stopped a number of killings by threatening and blocking American officers and enlisted soldiers of Company C, 1st Battalion, 20th Infantry Regiment, 11th Brigade, 23rd Infantry Division. Additionally, Thompson and his crew saved a number of Vietnamese civilians by personally escorting them away from advancing United States Army ground units and assuring their evacuation by air. Thompson reported the atrocities by radio several times while at Sơn Mỹ. Although these reports reached Task Force Barker operational headquarters, nothing was done to stop the massacre. After evacuating a child to a Quảng Ngãi hospital, Thompson angrily reported to his superiors at Task Force Barker headquarters that a massacre was occurring at Sơn Mỹ. Immediately following Thompson's report, Lieutenant Colonel Frank A. Barker ordered all ground units in Sơn Mỹ to cease search and destroy operations in the village. In 1970, Thompson testified against those responsible for the My Lai Massacre. Twenty-six officers and enlisted soldiers, including William Calley and Ernest Medina, were charged with criminal offenses, but all were either acquitted or pardoned. 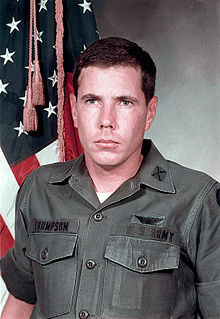 Thompson was condemned and ostracized by many individuals in the United States military and government, as well as the public, for his role in the investigations and trials concerning the My Lai massacre. As a direct result of what he experienced, Thompson experienced posttraumatic stress disorder, alcoholism, divorce, and severe nightmare disorder. Despite the adversity he faced, he remained in the United States Army until November 1, 1983, and continued to make a living as a helicopter pilot in the Southeastern United States. In 1998, 30 years after the massacre, Thompson and the two other members of his crew, Andreotta and Colburn, were awarded the Soldier's Medal (Andreotta posthumously), the United States Army's highest award for bravery not involving direct contact with the enemy. Thompson and Colburn returned to Sơn Mỹ to meet with survivors of the massacre at the Sơn Mỹ Memorial in 1998. In 1999, Thompson and Colburn received the Peace Abbey Courage of Conscience Award. When the Vietnam War began, Thompson felt obligated to return to military service. :135 In 1966, Thompson enlisted in the United States Army and completed the Warrant Officer Flight Program training at Fort Wolters, Texas, and Fort Rucker, Alabama. :47 In late-December 1967, at the age of 25, Thompson was ordered to Vietnam and assigned to Company B, 123rd Aviation Battalion of the 23rd Infantry Division. Army intelligence concerning the presence of Viet Cong in Sơn Mỹ was inaccurate, however, and the village's population was predominately composed of neutral, unarmed rice-farming families. Reconnaissance aircraft, including Thompson's OH-23 crew, flew over the Sơn Mỹ vicinity but received no enemy fire. :66 At 07:24, without validating intelligence reports, the United States Army shelled Sơn Mỹ, killing many Vietnamese civilians. Following the shelling, Company C (Charlie Company), 1st Battalion, 20th Infantry Regiment of Task Force Barker, led by Captain Ernest Medina, moved into Sơn Mỹ. Thompson recounted at an academic conference on My Lai held at Tulane University in December, 1994: "We kept flying back and forth, reconning in front and in the rear, and it didn't take very long until we started noticing the large number of bodies everywhere. Everywhere we'd look, we'd see bodies. These were infants, two-, three-, four-, five-year-olds, women, very old men, no draft-age people whatsoever." Then we saw a young girl about twenty years old lying on the grass. We could see that she was unarmed and wounded in the chest. We marked her with smoke because we saw a squad not too far away. The smoke was green, meaning it's safe to approach. Red would have meant the opposite. We were hovering six feet off the ground not more than twenty feet away when Captain Medina came over, kicked her, stepped back, and finished her off. He did it right in front of us. When we saw Medina do that, it clicked. It was our guys doing the killing. The helicopter looped around then set down quickly near the edge of the ditch. Andreotta had maintained visual contact with the spot where he saw the movement, and he darted out of the aircraft as soon as it touched the ground. Thompson got out and guarded one side of the chopper and Colburn guarded the other. Andreotta had to walk on several badly mangled bodies to get where he was going. He lifted a corpse with several bullet holes in the torso and there, lying under it, was a child, age five or six, covered in blood and obviously in a state of shock. Thompson continued to fly observation missions in the OH-23 and was hit by enemy fire a total of eight times. In four of those instances, his aircraft was lost. :146 In the last incident, his helicopter was brought down by enemy machine-gun fire, and he broke his back in the resulting crash landing. This ended his combat career in Vietnam. He was evacuated to a hospital in Japan and began a long period of rehabilitation. When news of the massacre publicly broke, Thompson repeated his account to then-Colonel William Wilson:222–235 and then-Lieutenant General William Peers during their official Pentagon investigations. In late-1969, Thompson was summoned to Washington, DC to appear before a special closed hearing of the House Armed Services Committee. There, he was sharply criticized by congressmen, in particular Chairman Mendel Rivers (D-S.C.), who were anxious to play down allegations of a massacre by American troops. :290–291 Rivers publicly stated that he felt Thompson was the only soldier at My Lai who should be punished (for turning his weapons on fellow American troops) and unsuccessfully attempted to have him court-martialed. Thompson was vilified by many Americans for his testimony against United States Army personnel. He recounted in a CBS 60 Minutes television program in 2004, "I'd received death threats over the phone...Dead animals on your porch, mutilated animals on your porch some mornings when you get up." After his Vietnam service, Thompson was assigned to Fort Rucker to become an instructor pilot and later received a direct commission, attaining the rank of captain and retired as a major. His other military assignments included Fort Jackson, South Korea, Fort Ord, Fort Hood, and bases in Hawaii. He retired from the army in 1983. Thompson became a helicopter pilot for the oil industry, operating in the Gulf of Mexico. In 1988 an English documentary film producer, Michael Bilton, working for Yorkshire Television, managed to contact Thompson via his mother, who was then widowed and living in Texas. At that point Thompson had all but disappeared from public life. Bilton had contacted former crew member Lawrence Colburn, and put Thompson and Colburn in touch with each other after a gap of nearly 16 years. Both Thompson and Colburn had been trying to find each other, but without success. Thompson was living in Lafayette, Louisiana, and Colburn near Atlanta, Georgia. They quickly arranged a reunion. Bilton spent a long weekend with Thompson discussing the events at My Lai. It proved the beginning of a long friendship which lasted until Thompson's death. Both Thompson and Colburn were interviewed for the film Four Hours in My Lai (1989) (Remember My Lai? on PBS) – which went on to win a British Academy Award and an international Emmy award. The interview showed Thompson relating what he had witnessed at My Lai: "Here we were supposed to be the guys in the white hats. It upset me". Bilton and his colleague Kevin Sim then began researching a book and Bilton conducted further interviews with Thompson and Colburn. When the book Four Hours in My Lai (1992) was published, it prompted a campaign to have the heroism of Thompson and his helicopter crew recognised. Several senior figures in the U.S. military supported the campaign, as did President George H. W. Bush. Thompson and Colburn were invited to speak to a wide range of audiences about the ethics of warfare including at West Point, a conference in Norway, and at Connecticut College in New London, where they were each awarded an honorary doctorate. In 1998, Thompson and Colburn returned to the village of Sơn Mỹ, where they met some of the people they saved during the killings, including Thi Nhung and Pham Thi Nhanh, two women who had been part of the group about to be killed by Brooks's 2nd Platoon. :77 Thompson said to the survivors, "I just wish our crew that day could have helped more people than we did." He reported that one of the women they had helped out came up to him and asked, "Why didn't the people who committed these acts come back with you?" He said that he was "just devastated" but that she finished her sentence: "So we could forgive them." He later told a reporter, "I'm not man enough to do that. I'm sorry. I wish I was, but I won't lie to anybody. I'm not that much of a man." Thompson and Colburn lit incense sticks and placed them in an urn by a stone marker at the irrigation ditch where many were murdered. They also dedicated a new elementary school for the children of the village. Thompson later served as a counselor in the Louisiana Department of Veterans Affairs, and gave a talk at the United States Naval Academy in 2003 and at West Point in 2005 on Professional Military Ethics. He also spoke at the United States Air Force Academy and to United States Marine Corps officers at Quantico. Thompson gave his first lecture to a U.S. Army audience, discussing physical and moral courage, at the U.S. Army Medical Department Center and School, Ft. Sam Houston, Texas, in 1998. Thompson and his crew's actions have been used as an example in the ethics manuals of U.S. and European militaries. :221 Thompson received an honorary degree from Emory University and The Stuart A. Rose Manuscript, Archives, and Rare Book Library at Emory University holds a collection relating to the life and careers of Hugh Thompson and Lawrence Colburn. In 2005, he retired from Louisiana Veterans Affairs. At the age of 62, after extensive treatment for cancer, Thompson was removed from life support and died on January 6, 2006, at the Veterans Affairs Medical Center in Pineville, Louisiana. Colburn came from Atlanta to be at his bedside. Thompson was buried in Lafayette, Louisiana, with full military honors, including a three-volley salute and a helicopter flyover. [not in citation given] On February 8, Congressman Charles Boustany (R-La.) made a statement in Congress honoring Thompson, stating that the "United States has lost a true hero, and the State of Louisiana has lost a devoted leader and dear friend." In 1998, exactly 30 years after the massacre, Thompson and the two other members of his crew, Glenn Andreotta and Lawrence Colburn, were awarded the Soldier's Medal (Andreotta posthumously), the United States Army's highest award for bravery not involving direct contact with the enemy. "It was the ability to do the right thing even at the risk of their personal safety that guided these soldiers to do what they did," then-Major General Michael Ackerman said at the 1998 ceremony. The three "set the standard for all soldiers to follow." Additionally on March 10, 1998, Senator Max Cleland (D-Ga.) entered a tribute to Thompson, Colburn and Andreotta into the record of the U.S. Senate. Cleland said the three men were "true examples of American patriotism at its finest." In 1999, Thompson and Colburn received the Peace Abbey Courage of Conscience Award. Later that year, both men served as co-chairs of STONEWALK, a group who pulled a one-ton rock engraved "Unknown Civilians Killed in War" from Boston to Arlington National Cemetery. In 2010, the Hugh Thompson Foundation was chartered in memory of Thompson's courage in halting the massacre. His biography The Forgotten Hero of My Lai: The Hugh Thompson Story by Trent Angers was included on the U.S. Army Chief of Staff's professional reading list. Folk singer David Rovics wrote a song about the incident at My Lai titled "Song for Hugh Thompson". Ryan Costello of The Oaks wrote a song commemorating Hugh Thompson's heroism in For Hugh Thompson, Who Stood Alone on the album Our Fathers and the Things They Left Behind. Thom Parrott (also known as Tom Parrott) wrote the song "Pinkville Helicopter" about the massacre that is included on the Smithsonian Folkways CD collection Best of Broadside. Jonathan Berger composed a piano concerto dedicated to Hugh Thompson. Commissioned by the National Endowment for the Arts, it was premiered at the United Nations General Assembly on January 24, 2001. A subsequent solo piano work, Elegy for the Victims of My Lai, adapted from the concerto was recorded and performed by pianist Sasha Toperich. The Kronos Quartet used Berger's music along with a libretto by Harriet Scott Chessman to compose a "monodrama" with tenor Rinde Eckert. Along with the strings of the quartet and various Vietnamese instruments played by the musician Van-Anh Vo, Eckert sang about Thompson's encounter with the massacre and the effect of the encounter on himself. The composition was presented at the Brooklyn Academy of Music in September 2017. ^ Ulaby, Neda (17 March 2018). "50 Years After The My Lai Massacre, An Opera Confronts The Past". NPR. Retrieved 14 September 2018. ^ a b c d e f g h i j k l m n o p q r s t u v w x y z aa ab ac ad Angers, Trent (2014). The Forgotten Hero of My Lai: The Hugh Thompson Story (Rev ed.). Acadian House. ISBN 0925417904. ^ a b "Obituary of Hugh Thompson Jr". The Times. 11 January 2006. Retrieved 2017-08-10. ^ a b c d e f g Bilton, Michael; Sim, Kevin (1992). Four Hours in My Lai. New York: Viking. ISBN 9780670842964. ^ "History of B Company 123rd Avn Bn". Bco123rdavnbn.org. Retrieved 2017-08-10. ^ a b "The Heroes of My Lai". Law2.umkc.edu. Retrieved 2017-08-10. ^ a b "'History is a Weapon: They Were Butchering People' later". Historyisaweapon.com. Retrieved 2017-08-10. ^ Zinn, Howard; Arnove, Anthony (2011). Voices of a People's History of the United States. Seven Stories Press. pp. 437–440. ^ Linder, Doug. "PEERS REPORT: Col. Oran Henderson". Law.umkc.edu. Archived from the original on 24 June 2010. Retrieved 10 August 2017. ^ Bilton, Michael (11 January 2006). "Hugh Thompson". The Guardian. Retrieved 10 August 2017. ^ "Hugh Thompson, 62, Who Saved Civilians at My Lai, Dies". The New York Times. Retrieved 2015-02-15. ^ "Hugh Thompson". Hugh Thompson Foundation. Archived from the original on 22 December 2015. Retrieved 8 December 2015. ^ "My Lai: A Half Told Story", London Sunday Times Magazine, pp. 28–29, 23rd April, 1989. ^ "Hugh Thompson, 62; Saved Civilians at My Lai". The New York Times. 7 January 2006. Retrieved 10 August 2017. ^ a b "'Blood and fire' of My Lai remembered 30 years later". Cnn.com. Retrieved 2015-02-15. ^ "A forgotten hero stopped the My Lai massacre 50 years ago today". LATimes.com. Retrieved 2018-03-18. ^ "HUGH THOMPSON" (PDF). Usna.edu. Retrieved 2017-08-10. ^ Robert Hathaway, CPT, MS, Faculty, U.S. Army Medical Department Center and School, Ft. Sam Houston, TX. ^ 1943-2006., Thompson, Hugh, (6 July 2006). "Hugh Thompson and Lawrence Colburn collection, 1967-2006". findingaids.library.emory.edu. ^ "Hugh C. Thompson Jr. obituary". Daily Advertiser (Lafayette, LA). 9 January 2006. Retrieved 14 September 2018. ^ Hugh Thompson Foundation Archived 2011-07-18 at the Wayback Machine A (501(c)(3) nonprofit founded by Lawrence Colburn in honor of Hugh Thompson). ^ "The Oaks — For Hugh Thompson, Who Stood Alone. My Lai Massacre, Vietnam, 1968 — Listen, watch, download and discover music for free at Last.fm". Last.fm. ^ Nichols, Charles (Ed.). CCRMA Overview. Stanford University: Center For Computer Research In Music And Acoustics Department Of Music, 2001. ^ Oestreich, James R. (28 September 2017). "Review: Kronos Quartet Revisits Vietnam Horror in 'My Lai'". The New York Times. Peers Inquiry: Report of the Department of the Army Review of the Preliminary Investigations into the My Lai Incident (1969). Wikiquote has quotations related to: Hugh Thompson Jr. The Heroes of My Lai (first-hand report by Thompson) Linder, Douglas (1999). The My Lai Courts-Martial, 1970. The Choices Made: Lessons from My Lai on drawing the line Bock, Paula (March 10, 2002), Seattle Times Magazine. My Lai Pilot Hugh Thompson via All Things Considered, NPR. Hugh Thompson’s Crewmember Remembers Helping to Stop the My Lai Massacre on Democracy Now! "Hugh Thompson Jr". Find a Grave. Retrieved 2008-07-13.